The deaths due to bad roads, speed breakers, potholes, in 2015 was 10,727 and number of people who lost lives was 3,416 which rose from 3,039 in previous year. ( Bad roads killed over 10k people in 2015: 3,416 due to potholes, Dipak K Dash, August 1,2016, timesofindia.indiatimes.com). Cases reported were 10,876 across the country according to data compiled by road transport ministry but as Ashish Kumar, former chief of the transport research wing opined, the number could be much higher as there is no robust and scientific mechanism for collecting data . Many accidents go unreported. Potholes killed almost 10 persons daily with total fatalities amounting to 3,597 , a 50% increase in 2017 from 2016. The magnitude of the accidents can be understood by the fact that terrorist attacks including ‘ Naxal ‘ attacks was 803. (Posted July 15, 2018, thehindujagruti.org) . Thus, road safety is being overlooked for years. Roads in several parts of the country often develop potholes during monsoon leading to accidents and traffic jams. ( July15,2018, scroll.in). Data shared by states show that 987 deaths were reported in UP followed by 726 in Maharashtra and so on. The deaths has stirred a debate on the inefficiency and corruption of Municipal bodies and road – owning authorities with government launching public awareness campaign. Lack of road discipline and most two- wheelers not using helmets has added to the problem over the years. Commenting on the situation road safety expert Rohit Baluja said negligent officials should be booked for culpable homicide not amounting to murder under IPC. (July 16,2018, defence.pk … …. World Affairs Forum … Central and South Asia). Union road ministry officials say that provision of fine has been made in Motor Vehicle Amendment Bill for poor and faulty design and maintenance by negligent and corrupt officials. The bill is stuck in the parliament due to frequent disruptions. The legislation does not spell out how to book authorities said Baluja and questioned the fixing of ‘ price’ for loss of lives. K. K. Kapila, chairman of International Roads Federation was optimistic that the legislation may lead to safer roads and urged the MPs to pass the amendment bill rising above party lines as the matter is important. Taking cognisance of the report of pothole deaths, the Supreme Court, a bench of justices Madan B Lokur and Deepak Gupta asked the SC appointed road safety committee to look into the issue and file report within two weeks. The panel headed by Justice (retd) K S Radhakrishnan has been asked to give suggest measures needed to deal with the problem. ( posted July 18,2018 kracktivist.org – SC expresses concern over pothole deaths). The bench also observed that families of those killed in such accidents should be entitled to compensation. Road accidents occur frequently in rainy season with open sewer flowing on the main paths of travel and potholes being invisible in the flow of water. It is unfortunate that the politicians raising hue and cry over the attacks by terrorists and Maoists do not take up the issue of road repairs and closing of potholes with similar intensity. Roads are used by common people not only to travel for offices or other cities but also to ferry goods or shift patients to hospitals. Merely observing ‘ road safety week’ will not solve the whole problem. Political will is crucial to take effective measures in providing good roads to travelling public. 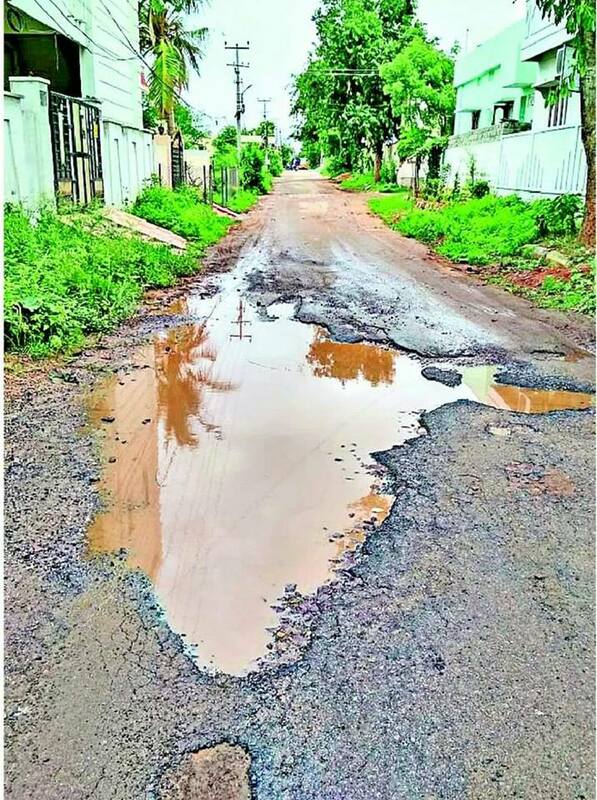 While the SC termed Mumbai pothole deaths as ‘ frightening’ , it is very sad that the PWD minister of Maharashtra Chandrakant Patil said that potholes alone cannot be blamed for accidents ( July 15, 2018, indianexpress.com). Trivializing of the deaths reflects apathy of political system towards a serious issue. Congress state chief Sanjay Nirupam said he would ‘ file an FIR’ on CM. This is playing politics over a burning issue. Solution lies in repairing roads on a war footing to stop such accidents rather than entering blame game that does not have any impact. Find companies that want to help.They like the publicity, especially as it makes the companies look good, which in turn drives up their sales. My Take on the Domino’s Paving story. The saying goes that the road to hell is paved with good intentions, but what if the road was paved with pizza?